A nuclear power station. Fog rises from the hyperboloid shaped cooling towers. The nuclear reactors are inside the cylindrical containment buildings. Nuclear power is the controlled use of nuclear reactions to release energy for work including propulsion, heat, and the generation of electricity. Human use of nuclear power to do significant useful work is currently limited to nuclear fission and radioactive decay. Nuclear energy is produced when a fissile material, such as uranium-235 ( 235U), is concentrated such that nuclear fission takes place in a controlled chain reaction and creates heat — which is used to boil water, produce steam, and drive a steam turbine. The turbine can be used for mechanical work and also to generate electricity. Nuclear power is used to power most military submarines and aircraft carriers and provides 7% of the world's energy and 15.7% of the world's electricity. Nuclear energy policy differs between countries. The United States produces the most nuclear energy, with nuclear power providing 20% of the electricity it consumes, while France produces the highest percentage of its electrical energy from nuclear reactors—80% as of 2006. Nuclear energy uses an abundant, widely distributed fuel, and mitigates the greenhouse effect if used to replace fossil-fuel-derived electricity. International research is ongoing into various safety improvements, the use of nuclear fusion and additional uses such as the generation of hydrogen (in support of hydrogen economy schemes), for desalinating sea water, and for use in district heating systems. Construction of nuclear power plants declined following the 1979 Three Mile Island accident and the 1986 disaster at Chernobyl. Lately, there has been renewed interest in nuclear energy from national governments, the public, and some notable environmentalists due to increased oil prices, new passively safe designs of plants, and the low emission rate of greenhouse gas which some governments need to meet the standards of the Kyoto Protocol. A few reactors are under construction, and several new types of reactors are planned. The use of nuclear power is controversial because of the problem of storing radioactive waste for indefinite periods, the potential for possibly severe radioactive contamination by accident or sabotage, and the possibility that its use in some countries could lead to the proliferation of nuclear weapons. Proponents believe that these risks are small and can be further reduced by the technology in the new reactors. They further claim that the safety record is already good when compared to other fossil-fuel plants, that it releases much less radioactive waste than coal power, and that nuclear power is a sustainable energy source. Critics, including most major environmental groups, believe nuclear power is an uneconomic, unsound and potentially dangerous energy source, especially compared to renewable energy, and dispute whether the costs and risks can be reduced through new technology. There is concern in some countries over North Korea and Iran operating research reactors and fuel enrichment plants, since those countries refuse adequate IAEA oversight and are believed to be trying to develop nuclear weapons. North Korea admits that it is developing nuclear weapons, while the Iranian government vehemently denies the claims against Iran. The first successful experiment with nuclear fission was conducted in 1938 in Berlin by the German physicists Otto Hahn, Lise Meitner and Fritz Strassmann. During the Second World War, a number of nations embarked on crash programs to develop nuclear energy, focusing first on the development of nuclear reactors. The first self-sustaining nuclear chain reaction was obtained at the University of Chicago by Enrico Fermi on December 2, 1942, and reactors based on his research were used to produce the plutonium necessary for the " Fat Man" weapon dropped on Nagasaki, Japan. Several nations began their own construction of nuclear reactors at this point, primarily for weapons use, though research was also being conducted into their use for civilian electricity generation. Electricity was generated for the first time by a nuclear reactor on December 20, 1951 at the EBR-I experimental fast breeder station near Arco, Idaho, which initially produced about 100 kW. In 1952 a report by the Paley Commission (The President's Materials Policy Commission) for President Harry Truman made a "relatively pessimistic" assessment of nuclear power, and called for "aggressive research in the whole field of solar energy". A December 1953 speech by President Dwight Eisenhower, " Atoms for Peace", set the U.S. on a course of strong government support for the international use of nuclear power. 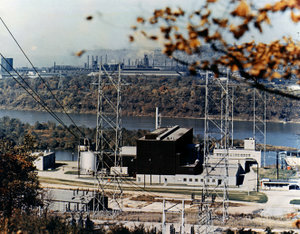 The Beaver Valley Nuclear Generating Station in Shippingport, Pennsylvania was the first commercial reactor in the USA and was opened in 1957. On June 27, 1954, the world's first nuclear power plant to generate electricity for a power grid started operations at Obninsk, USSR. The reactor was graphite moderated, water cooled and had a capacity of 5 megawatts (MW). The world's first commercial nuclear power station, Calder Hall in Sellafield, England was opened in 1956, a gas-cooled Magnox reactor with an initial capacity of 50 MW (later 200 MW). The Shippingport Reactor ( Pennsylvania, 1957), a pressurized water reactor, was the first commercial nuclear generator to become operational in the United States. In 1954, the chairman of the United States Atomic Energy Commission (forerunner of the U.S. Nuclear Regulatory Commission) talked about electricity being "too cheap to meter" in the future, often misreported as a concrete statement about nuclear power, and foresaw 1000 nuclear plants on line in the USA by the year 2000. Thanks to the presence of the nearby Bettis Laboratory and the Shippingport power plant, Pittsburgh, Pennsylvania became the world's first nuclear powered city in 1960. Installed nuclear capacity initially rose relatively quickly, rising from less than 1 gigawatt (GW) in 1960 to 100GW in the late 1970s, and 300GW in the late 1980s. Since the late 1980s capacity has risen much more slowly, reaching 366GW in 2005, primarily due to Chinese expansion of nuclear power. Between around 1970 and 1990, more than 50GW of capacity was under construction (peaking at over 150GW in the late 70s and early 80s) — in 2005, around 25GW of new capacity was planned. More than two-thirds of all nuclear plants ordered after January 1970 were eventually cancelled. During the 1970s and 1980s rising economic costs (related to vastly extended construction times largely due to regulatory delays) and falling fossil fuel prices made nuclear power plants then under construction less attractive. In the 1980s (U.S.) and 1990s (Europe), flat load growth and electricity liberalization also made the addition of large new baseload capacity unnecessary. A general movement against nuclear power arose during the last third of the 20th century, based on the fear of a possible nuclear accident and on fears of latent radiation, and on the opposition to nuclear waste production, transport and final storage. Perceived risks on the citizens health and safety, the 1979 accident at Three Mile Island and the 1986 Chernobyl accident played a key part in stopping new plant construction in many countries. Austria (1978), Sweden (1980) and Italy (1987) voted in referendums to oppose or phase out nuclear power, while opposition in Ireland prevented a nuclear programme there. However, the Brookings Institution suggests that new nuclear units have not been ordered primarily for economic reasons rather than fears of accidents. Financing for new reactors dried up when Wall Street's enthusiasm ended. Disillusionment was complete when new research discredited the claim (previously accepted as fact even by opponents) that nuclear power was still, despite all its problems, the most cost-effective source of electrity. Industry figures had omitted the factor of downtime. During the 1980s and early 1990s, the newest and biggest U.S. plants were actually producing only half the energy they were supposed to, due to shutdowns for refueling, routine maintenance, retrofitting, and frequent minor mishaps. Since that time, the capacity factor of existing nuclear power plants has increased dramatically, and has been near 90% in the current decade. As of 2006, the stated desire to use nuclear power for electricity generation has been suspected of being a cover for nuclear proliferation in the countries of Iran and North Korea. All current nuclear power plants are critical fission reactors, which are the focus of this article. The output of fission reactors is controllable. There are several subtypes of critical fission reactors, which can be classified as Generation I, Generation II and Generation III. All reactors will be compared to the Pressurized Water Reactor (PWR), as that is the standard modern reactor design. The difference between fast-spectrum and thermal-spectrum reactors will be covered later. In general, fast-spectrum reactors will produce less waste, and the waste they do produce will have a vastly shorter halflife, but they are more difficult to build, and more expensive to operate. Fast reactors can also be breeders, whereas thermal reactors generally cannot. These are reactors cooled and moderated by high pressure, liquid (even at extreme temperatures) water. They are the majority of current reactors, and are generally considered the safest and most reliable technology currently in large scale deployment, although Three Mile Island is a reactor of this type. This is a thermal neutron reactor design. These are reactors cooled and moderated by water, under slightly lower pressure. The water is allowed to boil in the reactor. The thermal efficiency of these reactors can be higher, and they can be simpler, and even potentially more stable and safe. Unfortunately, the boiling water puts more stress on many of the components, and increases the risk that radioactive water may escape in an accident. These reactors make up a substantial percentage of modern reactors. This is a thermal neutron reactor design. A Canadian design, (known as CANDU) these reactors are heavy-water-cooled and -moderated Pressurized-Water reactors. Instead of using a single large containment vessel as in a PWR, the fuel is contained in hundreds of pressure tubes. These reactors are fuelled with natural uranium and are thermal neutron reactor designs. PHWRs can be refueled while at full power, which makes them very efficient in their use of uranium (it allows for precise flux control in the core). Most PHWR's exist within Canada, but units have been sold to Argentina, China, India (pre-NPT), Pakistan (pre-NPT), Romania, and South Korea. India also operates a number of PHWR's, often termed 'CANDU-derivatives', built after the 1974 Smiling Buddha nuclear weapon test. A Soviet Union design, built to produce plutonium as well as power, the dangerous and unstable RBMKs are water cooled with a graphite moderator. RBMKs are in some respects similar to CANDU in that they are refuelable On-Load and employ a pressure tube design instead of a PWR-style pressure vessel. However, unlike CANDU they are very unstable and too large to have containment buildings. Because of this RBMK reactors are generally considered one of the most dangerous reactor designs in use. Chernobyl was an RBMK. These are generally graphite moderated and CO2 cooled. They have a high thermal efficiency compared with PWRs and an excellent safety record. There are a number of operating reactors of this design, mostly in the United Kingdom. Older designs (i.e. Magnox stations) are either shut down or will be in the near future. However the AGCRs have an anticipated life of a further 10 to 20 years. This is a thermal neutron reactor design. This is a theoretical reactor design that is part of the Gen-IV reactor project. It combines higher efficiency than a GCR with the safety of a PWR, though it is perhaps more technically challenging than either. The water is pressurized and heated past its critical point, until there is no difference between the liquid and gas states. An SCWR is similar to a BWR, except there is no boiling (as the water is critical), and the thermal efficiency is higher as the water behaves more like a classical gas. This is an epithermal neutron reactor design. Using lead as the liquid metal provides excellent radiation shielding, and allows for operation at very high temperatures. Also, lead is (mostly) transparent to neutrons, so fewer neutrons are lost in the coolant, and the coolant does not become radioactive. Unlike sodium, lead is mostly inert, so there is less risk of explosion or accident, but such large quantities of lead may be problematic from toxicology and disposal points of view. Often a reactor of this type would use a lead-bismuth eutectic mixture. In this case, the bismuth would present some minor radiation problems, as it is not quite as transparent to neutrons, and can be transmuted to a radioactive isotope more readily than lead. Most LMFBRs are of this type. The sodium is relatively easy to obtain and work with, and it also manages to actually remove corrosion on the various reactor parts immersed in it. However, sodium explodes violently when exposed to water, so care must be taken, but such explosions wouldn't be vastly more violent than (for example) a leak of superheated fluid from a CWR or PWR. The radioisotope thermoelectric generator produces heat through passive radioactive decay. Some radioisotope thermoelectric generators have been created to power space probes (for example, the Cassini probe), some lighthouses in the former Soviet Union, and some pacemakers. The heat output of these generators diminishes with time; the heat is converted to electricity utilising the thermoelectric effect. The chain reaction is controlled through the use of materials that absorb and moderate neutrons. In uranium-fueled reactors, neutrons must be moderated (slowed down) because slow neutrons are more likely to cause fission when colliding with a uranium-235 nucleus. Light water reactors use ordinary water to moderate and cool the reactors. When at operating temperatures if the temperature of the water increases, its density drops, and less neutrons passing through it are slowed enough to trigger further reactions. That negative feedback stabilizes the reaction rate. Integral Fast Reactor — The link at the end of this paragraph references an interview with Dr. Charles Till, former director of Argonne National Laboratory West in Idaho and outlines the Integral Fast Reactor and its advantages over current reactor design, especially in the areas of safety, efficient nuclear fuel usage and reduced waste. The IFR was built, tested and evaluated during the 1980s and then retired under the Clinton administration in the 1990s due to nuclear non-proliferation policies of the administration. Recycling spent fuel is the core of its design and it therefore produces a fraction of the waste of current reactors. Pebble Bed Reactor — This reactor type is designed so high temperatures reduce power output by doppler broadening of the fuel's neutron cross-section. It uses ceramic fuels so its safe operating temperatures exceed the power-reduction temperature range. Most designs are cooled by inert helium, which cannot have steam explosions, and which does not easily absorb neutrons and become radioactive, or dissolve contaminants that can become radioactive. Typical designs have more layers (up to 7) of passive containment than light water reactors (usually 3). A unique feature that might aid safety is that the fuel-balls actually form the core's mechanism, and are replaced one-by-one as they age. The design of the fuel makes fuel reprocessing expensive. SSTAR, Small, Sealed, Transportable, Autonomous Reactor is being primarily researched and developed in the US, intended as a fast breeder reactor that is tamper resistant and passively safe. Subcritical reactors are designed to be safer and more stable, but pose a number of engineering and economic difficulties. Controlled nuclear fusion could in principle be used in fusion power plants to produce safer, cleaner power, but significant scientific and technical obstacles remain. Several fusion reactors have been built, but as yet none has 'produced' more thermal energy than electrical energy consumed. Despite research having started in the 1950s, no commercial fusion reactor is expected before 2050. The ITER project is currently leading the effort to commercialize fusion power. It is possible to convert Thorium-232 into U-233 in reactors specially designed for the purpose. In this way, Thorium , which is more plentiful than uranium, can be used to breed U-233 nuclear fuel. U-233 is also believed to have favourable nuclear properties as compared to traditionally used U-235, including better neutron economy and lower production of long lived transuranic waste. Advanced Heavy Water Reactor — A proposed heavy water moderated nuclear power reactor that will be the next generation design of the PHWR type. Under development in the Bhabha Atomic Research Centre (BARC). KAMINI — A unique reactor using Uranium-233 isotope for fuel. Built by BARC and IGCAR Uses thorium. India is also building a bigger scale FBTR or fast breeder thorium reactor to harness the power with the use of thorium. Nuclear fuel — a compact, inert, insoluble solid. A nuclear reactor is only a small part of the life-cycle for nuclear power. The process starts with mining. Generally, uranium mines are either open-pit strip mines, or in-situ leach mines. In either case, the uranium ore is extracted, usually converted into a stable and compact form such as yellowcake, and then transported to a processing facility. At the reprocessing facility, the yellowcake is converted to uranium hexafluoride, which is then enriched using various techniques. At this point, the enriched uranium, containing more than the natural 0.7% U-235, is used to make rods of the proper composition and geometry for the particular reactor that the fuel is destined for. The fuel rods will spend about 3 years inside the reactor, generally until about 3% of their uranium has been fissioned, then they will be moved to a spent fuel pool where the short lived isotopes generated by fission can decay away. After about 5 years in a cooling pond, the spent fuel is radioactively cool enough to handle, and it can be moved to dry storage casks or reprocessed. Reprocessing can recover up to 95% of the remaining uranium and plutonium in spent nuclear fuel, putting it into new mixed oxide fuel. Reprocessing of civilian fuel from power reactors is currently done on large scale in Britain, France and (formerly) Russia, will be in China and perhaps India, and is being done on an expanding scale in Japan. Iran has announced its intention to complete the nuclear fuel cycle via reprocessing, a move which has led to criticism from the United States and the International Atomic Energy Agency. Reprocessing of civilian nuclear fuel is not done in the United States due to proliferation concerns. Nuclear power produces spent fuel, a unique solid waste problem. Highly radioactive spent fuel needs to be handled with great care and forethought due to the long half-lives of the radioactive isotopes in the waste. In fact, fresh spent fuel is so radioactive that less than a minute's exposure to it will cause death. However, spent nuclear fuel becomes less radioactive over time. After 40 years, the radiation flux is 99.9% lower than it was the moment the reactor was last shut off, although still dangerously radioactive. Spent fuel is primarily composed of unconverted uranium, as well as significant quantities of transuranic actinides (plutonium and curium, mostly). In addition, about 3% of it is made of fission products. The actinides (uranium, plutonium, and curium) are responsible for the bulk of the long term radioactivity, whereas the fission products are responsible for the bulk of the short term radioactivity. It is possible through reprocessing to separate out the actinides and use them again for fuel, but this often requires special fast spectrum reactors, which produce a reduction in long term radioactivity within the remaining waste. In any case, the remaining waste will be substantially radioactive for at least 300 years even if the actinides are removed, and for up to thousands of years if the actinides are left in. Even in the most optimistic scenarios, complete consumption of all actinides, and using fast spectrum reactors to destroy some of the long-lived non-actinides as well, the waste must be segregated from the environment for at least several hundred years, and therefore this is properly categorized as a long-term problem. There are, however, chemical plants which also produce hazardous waste staying in the environment for hundreds of years. A large nuclear reactor produces 3 cubic metres (25-30 tonnes) of spent fuel each year. As of 2003, the United States had accumulated about 49,000 metric tons of spent nuclear fuel from nuclear reactors. Unlike other countries, U.S. policy forbids recycling of used fuel and it is all treated as waste. After 10,000 years of radioactive decay, according to United States Environmental Protection Agency standards, the spent nuclear fuel will no longer pose a threat to public health and safety. The safe storage and disposal of nuclear waste is a difficult challenge. Because of potential harm from radiation, spent nuclear fuel must be stored in shielded basins of water, or in dry storage vaults or dry cask storage until its radioactivity decreases naturally ("decays") to safe levels. This can take days or thousands of years, depending on the type of fuel. Most waste is currently stored in temporary storage sites, requiring constant maintenance, while suitable permanent disposal methods are discussed. Underground storage at Yucca Mountain in U.S. has been proposed as permanent storage. 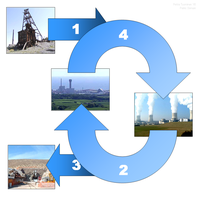 See the article on the nuclear fuel cycle for more information. The nuclear industry produces a volume of low-level radioactive waste in the form of contaminated items like clothing, hand tools, water purifier resins, and (upon decommissioning) the materials of which the reactor itself is built. In the United States, the Nuclear Regulatory Commission has repeatedly attempted to allow low-level materials to be handled as normal waste: landfilled, recycled into consumer items, etc. Much low-level waste releases very low levels of radioactivity and is essentially considered radioactive waste because of its history. For example, according to the standards of the NRC, the radiation released by coffee is enough to treat it as low level waste. Overall, nuclear power produces far less waste material than fossil-fuel based power plants. Coal-burning plants are particularly noted for producing large amounts of radioactive ash due to concentrating naturally occurring radioactive material in the coal. In addition, the nuclear industry fuel cycle produces many tons of depleted uranium (DU) which consists of U-238 with the easily fissile U-235 isotope removed. U-238 is a tough metal with several commercial uses — for example, aircraft production, radiation shielding, and making bullets and armor — as it has a higher density than lead. There are concerns that U-238 may lead to health problems in groups exposed to this material excessively, like tank crews and civilians living in areas where large quantities of DU ammunition have been used. The amounts of waste can be reduced in several ways. Both nuclear reprocessing and fast breeder reactors can reduce the amounts of waste and increase the amount of energy gained per fuel unit. Subcritical reactors or fusion reactors could greatly reduce the time the waste has to be stored. Subcritical reactors may also be able to do the same to already existing waste. It has been argued that the best solution for the nuclear waste is above ground temporary storage since technology is rapidly changing. The current waste may well become valuable fuel in the future, particularly if it is not reprocessed, as in the U.S. In countries with nuclear power, radioactive wastes comprise less than 1% of total industrial toxic wastes, which remain hazardous indefinitely unless they decompose or are treated so that they are less toxic or, ideally, completely non-toxic. A UK Royal Academy of Engineering report in 2004 looked at electricity generation costs from new plants in the UK. In particular it aimed to develop "a robust approach to compare directly the costs of intermittent generation with more dependable sources of generation". This meant adding the cost of standby capacity for wind, as well as carbon values up to £30 (€45.44) per tonne CO2 for coal and gas. Wind power was calculated to be more than twice as expensive as nuclear power. Without a carbon tax, the cost of production through coal, nuclear and gas ranged £0.022-0.026/ kWh and coal gasification was £0.032/kWh. When carbon tax was added (up to £0.025) coal came close to onshore wind (including back-up power) at £0.054/kWh — offshore wind is £0.072/kWh. Nuclear power remained at £0.023/kWh either way, as it produces negligible amounts of CO2. Nuclear figures included decommissioning costs. In one study, certain gas cogeneration plants were calculated to be three to four times more cost-effective than nuclear power, if all the heat produced was used onsite or in a local heating system. 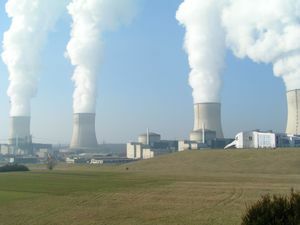 However, the study estimated only 25 year plant lifetimes (60 is now common), 68% capacity factors were assumed (above 90% is now common), other conservatisms were applied, and nuclear power also produces heat which could be used in similar ways (although most nuclear power plants are located in remote areas). The study then found similar costs for nuclear power and most other forms of generation if not including external costs (such as back-up power). Generally, a nuclear power plant is significantly more expensive to build than an equivalent coal-fuelled or gas-fuelled plant. Coal is significantly more expensive than nuclear fuel, and natural gas significantly more expensive than coal — thus, capital costs aside, natural gas-generated power is the most expensive. However servicing the capital costs for a nuclear power dominate the costs of nuclear-generated electricity, contributing about 70% of costs (assuming a 10% discount rate). The recent liberalisation of the electricity market in many countries has made the economics of nuclear power generation less attractive. Previously a monopolistic provider could guarantee output requirements decades into the future. Private generating companies have to accept shorter output contracts and the risks of future competition, so desire a shorter return on investment period which favours generation plants with lower capital costs. In many countries, licensing, inspection and certification of nuclear power plants has added delays and construction costs to their construction. In the U.S. many new regulations were put in place after the Three Mile Island partial meltdown. Building gas-fired or coal-fired plants has not had these problems. Because a power plant does not yield profits during construction, longer construction times translate directly into higher interest charges on borrowed construction funds. However, the regulatory processes for siting, licensing, and constructing have been standardized since their introduction, to make construction of newer and safer designs more attractive to companies. In Japan and France, construction costs and delays are significantly diminished because of streamlined government licensing and certification procedures. In France, one model of reactor was type-certified, using a safety engineering process similar to the process used to certify aircraft models for safety. That is, rather than licensing individual reactors, the regulatory agency certified a particular design and its construction process to produce safe reactors. U.S. law permits type-licensing of reactors, a process which is about to be used. To encourage development of nuclear power, under the Nuclear Power 2010 Program the U.S. Department of Energy (DOE) has offered interested parties the opportunity to introduce France's model for licensing and to subsidize 25% to 50% of the construction cost overruns due to delays for the first six new plants. Several applications were made, two sites have been chosen to receive new plants, and other projects are pending. In general, coal and nuclear plants have the same types of operating costs (operations and maintenance plus fuel costs). However, nuclear and coal differ in the relative size of those costs. Nuclear has lower fuel costs but higher operating and maintenance costs. In recent times in the United States savings due to lower fuel cost have not been low enough for nuclear to repay its higher investment cost. Thus no new nuclear reactors have been ordered in the United States since the 1970s. Coal's operating cost advantages have only rarely been sufficient to encourage the construction of new coal based power generation. Around 90 to 95 percent of new power plant construction in the United States has been natural gas-fired. One of the primary reasons for the uncompetitiveness of the U.S. nuclear industry has been the lack of any measure that provides an economic incentive to reduce carbon emissions ( carbon tax). Many economists and environmentalists have called for a mechanism to take into account the negative externalities of coal and gas consumption. In such an environment, it is argued that nuclear will become cost-competitive in the United States. Critics of nuclear power claim that it is the beneficiary of inappropriately large economic subsidies — mainly taking the forms of taxpayer-funded research and development and limitations on disaster liability — and that these subsidies, being subtle and indirect, are often overlooked when comparing the economics of nuclear against other forms of power generation. However, competing energy sources also receive subsidies. Fossil fuels receive large direct and indirect subsidies, like tax benefits and not having to pay for their pollution. Renewables receive large direct production subsidies and tax breaks in many nations. Energy research and development (R&D) for nuclear power has and continues to receive much larger state subsidies than R&D for renewable energy or fossil fuels. However, today most of this takes places in Japan and France: in most other nations renewable R&D get more money. In the U.S., public research money for nuclear fission declined from 2,179 to 35 million dollars between 1980 and 2000. However, in order to restart the industry, the next six U.S. reactors will receive subsidies equal to those of renewables and, in the event of cost overruns due to delays, at least partial compensation for the overruns (see Nuclear Power 2010 Program). According to the DOE, insurance for nuclear or radiological incidents in the U.S., is subsidized by the Price-Anderson Nuclear Industries Indemnity Act. In July 2005, Congress extended this Act to newer facilities. In the UK, the Nuclear Installations Act of 1965 governs liability for nuclear damage for which a UK nuclear licensee is responsible. The Vienna Convention on Civil Liability for Nuclear Damage puts in place an international framework for nuclear liability. Nuclear Power plants tend to be most competitive in areas where other fuel resources are not readily available — France, most notably, has almost no native supplies of fossil fuels. The province of Ontario, Canada is already using all of its best sites for hydroelectric power, and has minimal supplies of fossil fuels, so a number of nuclear plants have been built there. India too has few resources and is building new nuclear plants. Conversely, in the United Kingdom, according to the government's Department Of Trade And Industry, no further nuclear power stations are to be built, due to the high cost per unit of nuclear power compared to fossil fuels. However, the British government's chief scientific advisor David King reports that building one more generation of nuclear power plants may be necessary. China tops the list of planned new plants, due to its rapidly expanding economy and fervent construction in many types of energy projects. Most new gas-fired plants are intended for peak supply. The larger nuclear and coal plants cannot quickly adjust their instantaneous power production, and are generally intended for baseline supply. The market price for baseline power has not increased as rapidly as that for peak demand. Some new experimental reactors, notably pebble bed modular reactors, are specifically designed for peaking power. Any effort to construct a new nuclear facility around the world, whether an older design or a newer experimental design, must deal with NIMBY objections. Given the high profile of both the Three Mile Island and Chernobyl accidents, few municipalities welcome a new nuclear reactor, processing plant, transportation route, or experimental nuclear burial ground within their borders, and many have issued local ordinances prohibiting the development of nuclear power. However, a few U.S. areas with nuclear units are campaigning for more (see Nuclear Power 2010 Program). Current nuclear reactors return around 40-60 times the invested energy when using life cycle analysis. This is better than coal, natural gas, and current renewables except hydropower. The Rocky Mountain Institute gives other reasons why nuclear power plants may not be economical. In the U.S. this includes long lead times on risky investments, and the more cost-effective approach of investing in efficiency instead of new power plants. Nuclear power, coal, and wind power are currently the only realistic large scale energy sources that would be able to replace oil and natural gas after a peak in global oil and gas production has been reached (see peak oil). However, The Rocky Mountain Institute claims that in the U.S. increases in transportation efficiency and stronger, lighter cars would replace most oil usage with what it calls negawatts. Biofuels can then substitute for a significant portion of the remaining oil use. Efficiency, insulation, solar thermal, and solar photovoltaic technologies can substitute for most natural gas usage after a peak in production. Nuclear proponents often assert that renewable sources of power have not solved problems like intermittent output, high costs, and diffuse output which requires the use of large surface areas and much construction material and which increases distribution losses. For example, studies in Britain have shown that increasing wind power production contribution to 20% of all energy production, without costly pumped hydro or electrolysis/fuel cell storage, would only reduce coal or nuclear power plant capacity by 6.7% (from 59 to 55 GWe) since they must remain as backup in the absence of power storage. Nuclear proponents often claim that increasing the contribution of intermittent energy sources above that is not possible with current technology. Some renewable energy sources, such as solar, overlap well with peak electricial production and reduce the need of spare generating capacity. Future applications that use electricity when it is available (e.g. for pressurizing water systems, desalination, or hydrogen generation) would help to reduce the spare generation capacity required by both nuclear and renewable energy sources. Opponents argue that a major disadvantage of the use of nuclear reactors is the threat of a nuclear accident or terrorist attack and the possible resulting exposure to radiation. Proponents argue that the potential for a meltdown in non-Russian-designed reactors is very small due to the care taken in designing adequate safety systems, and that the nuclear industry has much better statistics regarding humans deaths from occupational accidents than coal or hydropower. While the Chernobyl accident caused great negative health, economic, environmental and psychological effects in a widespread area, the accident at Chernobyl was caused by a combination of the faulty RBMK reactor design, the lack of a properly designed containment building, poorly trained operators, and a non-existent safety culture. The RBMK design, unlike nearly all designs used in the Western world, featured a positive void coefficient, meaning that a malfunction could result in ever-increasing generation of heat and radiation until the reactor was breached. Even at Three Mile Island, the most severe civilian nuclear accident in the non-Soviet world, the reactor vessel and containment building were never breached, even though it had suffered a core meltdown, so that very little radiation (well below natural background radiation levels) was released into the environment. Design changes are being pursued in the hope of lessening some of the risks of fission reactors; in particular, automated and passively safe designs are being pursued. Fusion reactors which may come to exist in the future theoretically have little risk since the fuel contained in the reaction chamber is only enough to sustain the reaction for about a minute, whereas a fission reactor contains about a year's supply of fuel. Subcritical reactors never have a self sustained nuclear chain reaction. Opponents of nuclear power express concerns that nuclear waste is not well protected, and that it can be released in the event of terrorist attack, quoting a 1999 Russian incident where workers were caught trying to sell 5 grams of radioactive material on the open market, or the incident in 1993 where Russian workers were caught selling 4.5 kilograms of enriched uranium. The UN has since called upon world leaders to improve security in order to prevent radioactive material falling into the hands of terrorists, sometimes leading to the guarding of nuclear shipments by thousands of police. Other energy sources, such as hydropower plants and LNG carriers, are more vulnerable to accidents and attacks. Proponents of nuclear power contend, however, that nuclear waste is already well protected, and state their argument that there has been no accident involving any form of nuclear waste from a civilian program worldwide. In addition, they point to large studies carried out by NRC and other agencies that tested the robustness of both reactor and waste fuel storage, and found that they should be able to sustain a terrorist attack comparable to the September 11 terrorist attacks. Spent fuel is usually housed inside the plant's "protected zone" or a spent nuclear fuel shipping cask; stealing it for use in a "dirty bomb" is extremely difficult. Exposure to the intense radiation would almost certainly quickly incapacitate or kill any terrorists who attempt to do so. According to the Nuclear Regulatory Commission, 20 American states have requested stocks of potassium iodide which the NRC suggests should be available for those living within 10 miles of a nuclear power plant in the unlikely event of a severe accident. Most of the human exposure to radiation comes from natural background radiation. Most of the remaining exposure comes from medical procedures. Several large studies in the U.S., Canada, and Europe have found no evidence of any increase in cancer mortality among people living near nuclear facilities. For example, in 1990, the National Cancer Institute (NCI) of the National Institutes of Health announced that, after doing a large-scale study which evaluated the mortality rates from 16 types of cancer, no increased incidence of cancer mortality was found for people living near 62 nuclear installations in the United States. The study also showed no increase in the incidence of childhood leukemia mortality in the study of surrounding counties after the start-up of the nuclear facilities. The NCI study, the broadest of its kind ever conducted, surveyed 900,000 cancer deaths in counties near nuclear facilities. Aside from the immediate effects of the Chernobyl accident (see above), there is continuing impact from soils containing radioactivity in Ukraine and Belarus. For this reason a Zone of alienation was established around the Chernobyl plant. In March, 2006, safety reviews found that several nuclear plants in the United States have been leaking water contaminated with tritium into the ground. (The discharges were intended to go through discharge pipes into rivers, at levels which would be below below regulatory limits. However, by leaking into the ground, very low levels of tritium reached drinking water supplies.) The attorney general of Illinois announced that she was filing a lawsuit against Exelon because of six such leaks, demanding that the utility provide substitute water supplies to residents although no well outside company property shows levels that exceed drinking water standards. According to the NRC, "The inspection determined that public health and safety has not been adversely affected and the dose consequence to the public that can be attributed to current onsite conditions is negligible with respect to NRC regulatory limits." However, the chairman of the Nuclear Regulatory Commission, said, "They're going to have to fix it." Opponents of nuclear power point out that nuclear technology is often dual-use, and much of the same materials and knowledge used in a civilian nuclear program can be used to develop nuclear weapons. This concern is known as nuclear proliferation and is a major reactor design criterion. The military and civil purposes for nuclear energy are intertwined in most countries with nuclear capabilities. In the U.S., for example, the first goal of the Department of Energy is "to advance the national, economic, and energy security of the United States; to promote scientific and technological innovation in support of that mission; and to ensure the environmental cleanup of the national nuclear weapons complex." The enriched uranium used in most nuclear reactors is not concentrated enough to build a bomb. Most nuclear reactors run on 4% enriched uranium; Little Boy used 90% enriched uranium; while lower enrichment levels could be used, the minimum bomb size would rapidly become infeasibly large as the level was decreased. However, the same plants and technology used to enrich uranium for power generation can be used to make the highly enriched uranium needed to build a bomb. In addition, the plutonium produced in power reactors, if concentrated through reprocessing, can be used for a bomb. 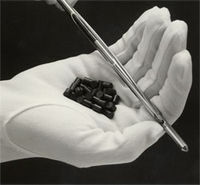 While the plutonium resulting from normal reactor fuelling cycles is less than ideal for weapons use because of the concentration of Pu-240, a usable weapon can be produced from it. If the reactor is operated on very short fuelling cycles, bomb-grade plutonium can be produced. However, such operation would be virtually impossible to camouflage in many reactor designs, as the frequent shutdowns for refuelling would be obvious, for instance in satellite photographs. It is widely believed that the nuclear programs of India and Pakistan used CANDU reactors to produce fissionable materials for their weapons; however, this is not entirely accurate. Both Canada (by supplying the 40 MW research reactor) and the United States (by supplying 21 tons of heavy water) supplied India with the technology necessary to create a nuclear weapons programme, dubbed CIRUS (Canada-India Reactor, United States). Because international policies did not dictate usage of nuclear technology transfers, India was able to use the technology to create a nuclear weapon. Pakistan is believed to have produced the material for its weapons from an indigenous enrichment program. Several states did not sign the treaty and were able to use international nuclear technology (often procured for civilian purposes) to develop nuclear weapons (India, Pakistan, Israel, and South Africa). South Africa has since signed the NPT, and now holds the distinction of being the only known state to have indigenously produced nuclear weapons, and then verifiably dismantled them. Of those who have signed the treaty and received shipments of nuclear paraphernalia, many states have either claimed to, or been accused of, attempting to use supposedly civilian nuclear power plants for developing weapons, including Iran and North Korea. Certain types of reactors are more conducive to producing nuclear weapons materials than others, and a number of international disputes over proliferation have centered on the specific model of reactor being contracted for in a country suspected of nuclear weapon ambitions. New technology, like SSTAR, may lessen the risk of nuclear proliferation by providing sealed reactors with a limited self-contained fuel supply and with restrictions against tampering. One possible obstacle for expanding the use of nuclear power might be a limited supply of uranium ore, without which it would become necessary to build and operate breeder reactors. However, at current usage there is sufficient uranium for an extended period — "In summary, the actual recoverable uranium supply is likely to be enough to last several hundred (up to 1000) years, even using standard reactors." Breeder reactors have been banned in the U.S. since President Jimmy Carter's administration prohibited reprocessing because of what it regarded as the unacceptable risk of proliferation of weapons-grade materials. Some proponents of nuclear power agree that the risk of nuclear proliferation may be a reason to prevent nondemocratic developing nations from gaining any nuclear technology but argue that this is no reason for democratic developed nations to abandon their nuclear power plants. Especially since it seems that democracies never make war against each other (See the democratic peace theory). In February, 2006, a new U.S. initiative, the Global Nuclear Energy Partnership was announced. It would be an international effort to reprocess fuel in a manner making proliferation infeasible, while making nuclear power available to developing countries. Non-radioactive water vapour is the significant operating emission from nuclear power plants. Fission produces gases such as iodine-131 or Xenon-133 which have to be stored on-site for several half-lives until they have decayed to safe levels. Nuclear generation does not directly produce sulphur dioxide, nitrogen oxides, mercury or other pollutants associated with the combustion of fossil fuels (pollution from fossil fuels is blamed for many deaths each year in the U.S. alone). It also does not directly produce carbon dioxide, which has led some environmentalists to advocate increased reliance on nuclear energy as a means to reduce greenhouse gas emissions (which contribute to global warming). Like any power source (including renewables like wind and solar energy), the facilities to produce and distribute the electricity require energy to build and subsequently decommission. Mineral ores must be collected and processed to produce nuclear fuel. These processes are either directly powered by diesel and gasoline engines, or draw electricity from the power grid, which may be generated from fossil fuels. Life cycle analyses assess the amount of energy consumed by these processes (given today's mix of energy resources) and calculate, over the lifetime of a nuclear power plant, the amount of carbon dioxide saved (related to the amount of electricity produced by the plant) vs. the amount of carbon dioxide used (related to construction and fuel acquisition). Several life cycle analyses show similar emissions per kilowatt-hour from nuclear power and from renewables such as wind power. According to one life cycle study by van Leeuwen and Smith from 2001–2005, carbon dioxide emissions from nuclear power per kilowatt hour could range from 20% to 120% of those for natural gas-fired power stations depending on the availability of high grade ores. The study was rebutted in detail by the World Nuclear Association. In 2006, a UK government advisory panel, The Sustainable Development Commission, concluded that if the UK's existing nuclear capacity were doubled, it would provide an 8% decrease in total UK CO2 emissions by 2035. This can be compared to the country's goal to reduce greenhouse gas emissions by 60 % by 2050. As of 2006, the UK government was to publish its official findings later in the year. Nuclear reactors require cooling, typically with water (sometimes indirectly). The process of extracting energy from a heat source, called the Rankine cycle, requires the steam to be cooled down. Rivers are the most common source of cooling water, as well as the destination for waste heat. The temperature of exhaust water must be regulated to avoid killing fish; long-term impact of hotter-than-natural water on ecosystems is an environmental concern. In most new facilites, this problem is solved by implementing cooling towers. The need to regulate exhaust temperature also limits generation capacity. On extremely hot days, which is when demand can be at its highest, the capacity of a nuclear plant may go down because the incoming water is warmer to begin with and is thus less effective as a coolant, per unit volume. This was a significant factor during the European heat wave of 2003. Engineers consider this in making improved power plant designs because increased cooling capacity will increase costs.